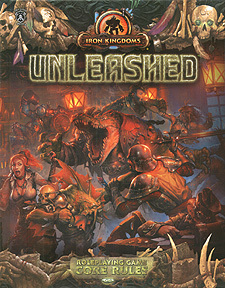 Experience the primal nature of the more uncivilized parts of the Iron Kingdoms through a robust, visceral rules system that is also fully compatible with the award-winning Iron Kingdoms Full Metal Fantasy rules. Become a savage hero and evolve into a legend with iconic careers including bone grinders, bloodweavers, monster hunters, warlocks, and more. Tap into your inner beast as one of eight playable races, each with their own strengths and attributes: bog trog, farrow, gatorman, human, Nyss, pyg, Tharn, and trollkin. Control powerful warbeasts, craft magical talismans from the bodies of your fallen foes, and fight to survive in unforgiving environments. Immerse yourself in life in the wilderness and the savage history of western Immoren. Become a hero. Eat what you kill.